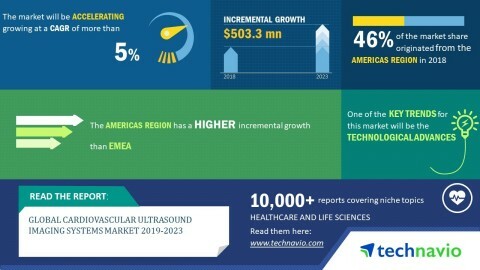 LONDON--(BUSINESS WIRE)-- The global cardiovascular ultrasound imaging systems market 2019-2023 is expected to post a CAGR of more than 5% during the forecast period, according to the latest market research report by Technavio. A key factor driving the growth of the market is an increase in product launches for ultrasound imaging by the cardiovascular imaging system. Product launches help companies in expanding their product ranges and in penetrating various regions to strengthen their market presence. With an increasing number of product approvals and launches in the market, more vendors are focusing on developing next-generation systems for ultrasound imaging. It helps vendors sustain the intense competition in the market and expand their product portfolio. Thus, the increasing number of products launches for ultrasound imaging by the cardiovascular imaging system is expected to drive the growth of the global cardiovascular ultrasound imaging systems market during the forecast period. This market research report on the global cardiovascular ultrasound imaging systems market 2019-2023 also provides an analysis of the most important trends expected to impact the market outlook during the forecast period. Technavio classifies an emerging trend as a major factor that has the potential to significantly impact the market and contribute to its growth or decline. Vendors are coming up with innovative and better technology advancement to overcome the shortcomings of old systems. There are introducing new cardiovascular ultrasound systems that ensure less scan time and provide better image visualization. It further helps provide guidance to cardiologists for the treatment of structural heart disease. Such technology advancement is expected to increase during the forecast period. “Koninklijke Philips launched the EPIQ CVx cardiovascular ultrasound system in August 2018, which provides fast data processing and sharper imaging along with the anatomy of the mitral valves. Similarly, Siemens Healthcare received the US FDA approval for the launch of the TrueFusion application with its ACUSON 2000 cardiovascular ultrasound system in September 2017, which helps in integrating ultrasound and angiography images.,” says a senior analyst at Technavio. This market research report segments the global cardiovascular ultrasound imaging systems market by product (2D, 3D, 4D, and 5D cardiovascular ultrasound imaging systems) and geographical regions (APAC, EMEA, and the Americas). The Americas led the market in 2018 with a market share of 46%, followed by EMEA and APAC respectively. The dominance of the Americas can be attributed to the increase in product launches and growing awareness about cardiovascular diseases.